Born in 1976 in Warsaw. He has been travelling, mostly around Asia, since he was 17 years old. He is a cultural anthropologist by education. He has been writing reportages for, among others, Tygodnik Powszechny for 10 years, in which he reported on warfare in Georgia in 2008, in Sri Lanka in 2009, events in Afghanistan, Pakistan, India, Libya and other places. The author of two reportage books: Miraż. Trzy lata w Azji [Mirage. Three Years in Asia] and Zenga, zenga, czyli jak szczury zjadły króla Afryki [Zenga, zenga, or How Rats Ate the King of Africa]. He intends to write another reportage on Goa this winter. He has been living in Asia since 2008, currently in Vietnam. 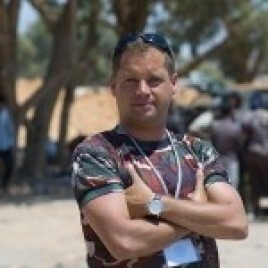 On 24th October Andrzej Meller will be talking about An extreme reporter.